BALTIMORE — When Manny LeGros went to watch a recent Orioles baseball game, he spent much of it in the concourse instead of in his seat. Because that’s where the buffet was. With a ticket to the Orioles’ Left Field Club Picnic Perch, LeGros was entitled to an all-you-can-eat buffet of nachos, hot dogs, peanuts, popcorn, lemonade, sodas and ice cream. He could have stayed in his seat and watched the game in person — that’s the reason millions of people go to see baseball in the first place — but the lure of a third bucket of nachos proved too difficult to resist. 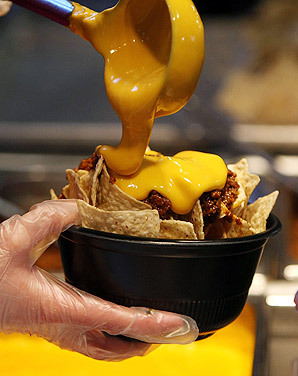 Baltimore Orioles fans like Manny LeGros eat as many buckets of nachos with chili as they can during a nine-inning game. Gorging yourself on food "is how you show you're a real fan," LeGros says. The left-field sections at Camden Yards are part of the growing trend of all-you-can-eat style options in major league ballparks. For $40 per ticket in the section, fans are entitled to a buffet-style choice that includes all the above-mentioned foods and even salad — but only to mitigate the heartburn from the chili. LeGros uses a sickly appropriate baseball metaphor when admitting he eats “double to triple” the amount of food that he would if it were not being shoveled out of bottomless troughs. LeGros said he wants to take a road trip to Cleveland, where the Indians promote their all-you-can-eat section on their website with the opening tagline of, “How much food can you eat?” while offering fans a chance to “test their limitations.” He also wants to visit Detroit, and buy a ticket to “Trough of the Tigers,” where hungry Tigers fans eat nachos and ice cream out of “bottomless” metal trenches. The all-you-can-eat trend worries some critics, like the American Medical Association, which notes that nearly 34 percent of all American adults and 17 percent of children are obese. Given America’s epidemic of obesity, they also question whether it is socially responsible for teams to set up these all-you-can-eat sections. But baseball executives like Ed Pattermann believe that having a legion of overeating fans gives them a business advantage — even, perhaps, an edge on the field. In addition to noting that the fatter fans are, the harder they’ll find it to travel to distant ballparks, Pattermann also notes one exciting plan the ball club plans to debut next season.